Thanks Mr. Dusty Black for sharing this with me last night…it’s really something to see. Wow, powerful shock and awe…turn up the volume! It’s that time of year when the summer heat can really push you over the edge when it comes to training and just as important – racing. You don’t need a thermometer or to check the weather to know that it’s hot and humid. It’d be quicker to step outside and notice the immediate beads of sweat start to roll down your face along with your sunglasses fogging up. Some of you dread the heat, some of you don’t mind. But here’s why you should mind. Recently, in a group of elite cyclists completing just a 30-minute time trial in moderate heat of 90 degrees Fahrenheit, their overall power output was lower by 6.5% than when performing a time trial in a thermoneutral environment of 73F. (Tatterson) So yes, even in elite cyclists and moderate heat exposure, your performance decreases. So what can you do to minimize these performance decrements? Get used to it – literally – and get heat acclimated. Besides improving your ability to perform at a high level in the heat, heat acclimation also starves off serious health risks when you are exposed to the heat. Not being heat acclimated exposes you to several risks including muscle cramps, feeling faint, inability to coordinate muscular movements, headache, nausea, vomiting, dizziness, hyperthermia, shortness of breath and overall general fatigue. Since the ITU circuit was in my neck of the woods (sort of..), I made the trek down to our nation’s capital to watch the third leg of the ITU World Championship Series (WCS). And it was well worth the trip because I got to watch two amazing races. The first thing you notice is the atmosphere that surrounds the event. Everything about it breathes elite racing. The start line is not composed of a few elite athletes with a lot of part-time “pros”. It is entirely composed of elite, professional athletes. Athletes with Olympic aspirations, competing for very good (for our sport…) prize-money. Because of the level of the athletes, everyone watching either at the race site or at home through the Internet were treated to two very competitive races, with constant changes in the dynamics of the race, which made them both interesting and very fun to watch. When I got back home at the end of the day, I checked how Ironman Coeur d’Alene was going. And the contrast with the ITU WCS race was evident. With extremely weak fields, both men’s and women’s race were far from exciting, with second place for the men being 10 minutes behind the winner and third place almost 20 minutes down (!). The women’s race was a little more “exciting”, but just for the battle for second place. All this for the first Ironman race of the year in US soil. The writing is on the wall: professional Ironman racing is dying. This is not new, it’s been a slow death, brought on by stagnating prize-money purses and the increased number of races, causing a watering down of the competition. But this slow death is somewhat puzzling given the growth of the sport in the last years. With its logic of maximizing the profit out of the events that runs, the WTC is showing an incredibly narrow focus that is hurting the sport as a whole. This effect might not be noticeable right now, but it will be in the future. Going back to the ITU World Championship Series, it seems to be a risky bet that is paying off. Having the best athletes perform in great stages around the World is a great idea, and one that is advancing triathlon more and more into being a worldwide sport. The race in DC is a perfect example. Just like having the Tour de France ending in the Champs Elysees, the streets of downtown DC were the perfect backdrop to bring triathlon into the mainstream. Big kudos to the ITU and the local organizing committee. Saint-Jean-de-Monts. Les meilleures chances locales de podium reposeront, dimanche, sur l’Américain Kévin Everett, et le Français Nicolas Alliot. Après Les Sables et Jard, Saint-Jean-de-Monts organise son épreuve internationale, ce week-end. Au programme, samedi, le championnat de France par équipes D2. Les étrangers les plus connus présents ? Kristian Mac Cartney (Cesson-Sévigné) et le Belge Axel Zeebroek (Besançon). Axel Zeebroek s’est fait remarquer lors des derniers Jeux, en posant le vélo seul en tête, avec le Luxembourgeois Dirk Bockel. Tous deux pourraient doubler, dimanche, et se mesurer au favori, le Français Stéphane Poulat. Les Montois, eux, évolueront à domicile, avec l’envie de bien faire. A l’image du Luçonnais Nicolas Alliot et de l’Américain Kévin Everett, pour qui ce sera sa première course en France. Formé à Luçon, le jeune lycéen de Mendès-France, à La Roche, a rejoint le 2e club vendéen (derrière Les Sables), il y a trois saisons. Une première année pour voir et progresser, une deuxième pour aider l’équipe élite à rejoindre la D1 (chose faite), et une troisième pour faire sa place. En début de saison, il a tenté de se qualifier pour les championnats d’Europe juniors. Mais, blessé, la barre était trop haute. Depuis, il a pris la 2e place de son équipe, lors du Grand Prix, à Beauvais (66e), et une 3e place, le week-end dernier, à Jard, derrière son coéquipier, Torok (2e). Après un Hongrois, Nicolas Alliot fera donc équipe, dimanche, avec un Américain de 34 ans. L’équipe de Saint-Jean-de-Monts : Nicolas Alliot, Julien Leroy, Mathieu Agnus, Alfred Torok (Hongrie), Adam Fitzakerley (Australie), Ruben Bravo, Andrès Del Castillo-Carnevalli, Anton Ruanova-Fernandez (Espagne), Ethan Brown et Kévin Everett (Etats-Unis). Le programme. Samedi : 14 h, Grand Prix D2 femmes ; 15 h 30, Grand Prix D2 hommes ; 17 h, avenirs (7-14 ans). Dimanche : 10 h, découverte et relais ; 10 h 30, triathlon féminin ; 14 h 30, international courte distance. Like the all the greatest athlete and coach combinations, Javier Gomez, along with Jose Rioseco, are redefining the sport of triathlon with efficiency, talent, and pure speed. Spaniard Javier Gomez doesn’t spin his wheels like other less efficient triathletes. All his horsepower goes directly onto the pavement, pedals and water. This not only propels him forward in a race, but it also consigning the old standards of men’s triathlon to the past. Like the leaders of the sport before him; Mark Allen, Brad Beven, and Simon Lessing, Gomez’s career is starting to acquire the momentum of a runaway success. His racing resumé of nine BG World Cup wins and 15 consecutive podiums is quickly exceeding dominance, eagerly edging its way toward legendary (the men’s World Cup win record for an active athlete stands at 11, held by 2000 Olympic champion, Canadian Simon Whitfield). But it is another champion athlete that Gomez, 25, is beginning to resemble most. Both were born in Basel, Switzerland but the similarities don’t end there. Triathlete Gomez and tennis player Roger Federer seem close sporting cousins. Both share an ability to single-handedly reset their sport’s perimeters of possibility, all with what looks like a modicum of effort. As Federer rips a stunning cross-court winner with more angle than a marine’s sideburns, Gomez crushes the hearts of his opposition with unparalleled swim and run poise. Gomez’s swim is freakish. His best 1500-meter time is under 16 minutes, which puts him in a class alone with former swimmer Andy Potts of the United States. But the difference with Potts is that Gomez’s swim personal best was recorded this year when training for triathlon not in his competitive swimming days. Hard for Gomez one week, easy the next—he’s that type of athlete. In Mooloolaba, after the beach start, Gomez tripped over the first carpet of water—it wasn’t even a wave—when the other athletes beside him, all Kiwis and Aussies with surf skills to burn, waded another 20 meters or so. Another athlete in this situation might have dreaded the same predicament reoccurring in the beach start at New Plymouth the following weekend, but not Gomez. He led on the beach run to the water, replacing his bellyflop of the previous week, with a few giant steps. The fact he subsequently added a couple of graceful duck dives proved he is a quick school and reaffirmed his Federer type genius. Gomez’s race brilliance does not end there. 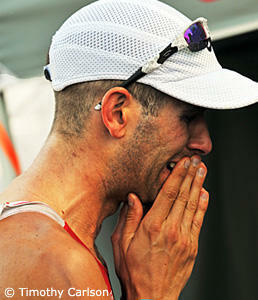 His run is now second to none and because of his swim, it goes against triathlon’s natural order. Triathlon’s natural order states that a pure swimmer CANNOT be a pure runner. Australia’s Craig Walton and Athens Olympic gold medalist Kate Allen exemplify this. Gomez, however, does not run like a swimmer or swim like a runner—he swims like a fish and runs like a gazelle. And his physical appearance on the run should not deceive the spectator. The ruby hue that flushes Gomez’s cheeks is only a red herring, fooling the viewer that he is hurting. It only acts to distract from the relative ease of his strides, the smoothness of his locomotion—again the triathlon equivalent of Federer. Before the 2008 BG Triathlon World Cup season commenced, Gomez spent some time training in South Africa. One of his sessions included a running race. 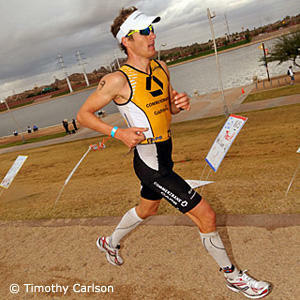 Great Britain’s Tim Don is known as probably the number one triathlon track runner with a 3:46:60 PB for 1500 meters. But sometimes Don’s form does not carry over to running ten kilometers off the bike. For Gomez, it always does. On Mooloolaba’s hilly 10-kilometer run course, Gomez knocked out 30:29 and on the undulations in New Plymouth, 29:37. If you couple this, as Gomez did, with second out of the water the results are scary for the opposition. They are also scary if you are the type of athlete that likes to slink into an Olympic year with solid races building to a crescendo. Gomez, obviously, is not this type of athlete. To him, great form now is a harbinger to great form in the future. His coach Jose Rioseco was also happy with his athlete’s early season form. As Gomez loomed large down the finish straight in New Plymouth, Rioseco stopped pacing and started punching the air. The victory obviously meant a lot and it was a team effort. After New Plymouth post-race press interviews, countless selfless t-shirt signings and drug testing, it was time for coach and athlete to make the 4-kilometer journey back to the Devon Hotel. Wheeling his bike when the rest had ridden, Javier Gomez joined his coach for the tramp home as darkness descended. When victories convert to Olympic confidence, they crunched the numbers and plotted the next along the deserted Sunday night streets. Their partnership becoming as successful as coach Tony Roche and Roger Federer when the pair worked together in his prime. Former World Number one Chris Hill brings his unique elite athlete perspective in weekly Olympic columns to ITU’s website, triathlon.org. 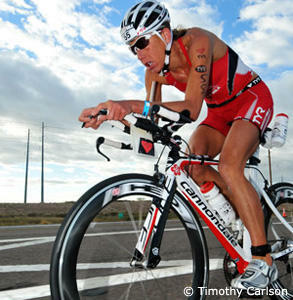 He competed on the ITU World Cup circuit, winning three titles and ten medals in total. He was crowned the overall World Cup series champion in 2001. That same year he was silver medalist at the ITU World Championships in Edmonton, Canada. 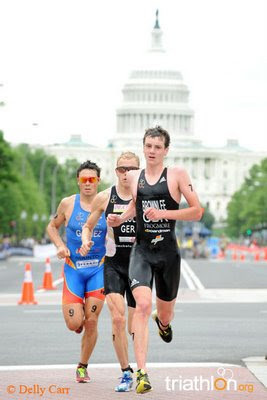 Watch for Chris Hill’s column, “Olympic Odyssey” every week on triathlon.org. 2008 ITU Season is coming…. This is a story about butter. Somewhere in the telling, power and desire and revenge creep in, but fundamentally it is a story about butter. Man evolved in the cradle of civilization, at the confluence of the Tigris and Euphrates, amid warm breezes and hospitable soils. As man wandered and spread, he ventured to less hospitable climes that required him to build shelters. In his home and away from the land, man desired ways to preserve food for tomorrow, so he salted and pickled and preserved and eventually cooled, first with ice and later the refrigerator. In warm weather, desiring to protect his animal’s products from the heat, he placed butter inside the refrigerator and it stayed cold and firm for him. When kept outside the refrigerator during moderate temperatures, man discovered that butter stays soft and spreadable, a much desired quality. So as to avoid removing the butter in mild weather and placing it back into the refrigerator during warm weather, he invented a particular spot for his butter, a compartment with a warm surface where he could control the temperature and soften the butter to his liking. And so the butter sits in its compartment, soft to the touch but not melting at 50 degrees, inside a refrigerator cooled to 40 degrees, inside a home heated to 70 degrees, in a climate where the outside air might be 50 degrees. Three layers of precisely regulated thermal control engineered to provide man his desired butter at the desired temperature, all of the time. How we have fallen. Our need for control and convenience and possessions has driven us to madness, no longer able to respect the earth that long has sustained us. This earth is recoiling, straining and shifting beneath our weight, yet we insist on maintaining our foolhardy ways. Our swath of destruction cuts wide, no longer limited to securing food, clothing, shelter. Our pastimes-the things we pursue for amusement-now scar the land, pollute the skies, befoul the water. We pander to our basest instincts-the thrill of the hunt, the rush of competition-while ignoring the intelligence we have cultivated over a millennium. On October 13, 2007, an army of athletes assembled upon the island of Hawaii for the Ironman world championship. From all corners of the globe they came, 1,787 strong, to prove their ability to conquer the water and ground beneath them. Aside from 68 residents of the state of Hawaii, all of them flew jet airliners to attend; the combined distance traveled amounted to 18,312,992 miles (portlandtri.com/miles.html). Eighteen million miles-for one day of sport. The jet airplanes belched 3,634 tons of carbon dioxide and other destructive greenhouse gases into the atmosphere, the equivalent generated by 525 average American homes producing heat and light for one year. When did we stop caring? When did it become acceptable to shirk responsibility, to shift it to another person, another country, another generation? This fall I volunteered at the Westchester Triathlon in New York. After the race, I stood beneath an unusually warm September sun breaking down bike racks in an endless parking lot. I tore them down and placed them in the back of a truck; by mid-afternoon, all that remained of the transition area was trash, the waste generated by 1,000 athletes over a six-hour span. Gel packets. Scraps of bagel. Plastic water bottles by the hundreds, a consequence of our evolution to single-use containers. All of it destined for the landfill, as Westchester does not contract a recycler. The amount of trash, and the inability of its producers to shuttle it to the trash can, was astounding. As I stood resting, preparing to resume cleanup, two Team-in-Training women joined me in the otherwise empty lot. They each carried a plastic bag. Wordlessly they began circulating, emptying bottles and cans, placing them into the bags. As I broke down a nearby aid station, I watched the parking lot transform from a field of litter to a manageable bulk of waste. They disappeared after an hour and a half, taking their collected recycling with them. They probably saved Westchester half its trash bill. Sport has long been an innovator. Things we have learned about health, longevity and nutrition have often been driven by athletics. Through it we have discovered new materials, perfected technologies, improved systems and processes. And yet sport now falls behind, catering more to conspicuous consumption than long-held principles of conservation, efficiency and adaptability. With our food, we demand organic. Our homes are triple-sealed against drafts, our thermostats and lighting computer-controlled. We buy Priuses and separate glass from cardboard. Yet our races stagnate. At the Chicago Marathon, 1.8 million cups were used to dispense water; few events practice recycling or composting. We travel thousands of miles to “destination races” while the local YMCA can’t draw 100 to its Spring Fling. A steel bike could last a lifetime; instead we buy carbon and replace it the very next year. Sport is stuck in the age of excess. While the rest of the world educates itself about carbon offsets, global warming and alternative energy, we content ourselves with bigger cars (to haul our gear) and more exotic races. It is no longer acceptable for those who care to clean up for the rest of us. Jeff Henderson forsook the world of competitive swimming for triathlon in 1997. Since then he has busied himself competing, officiating, writing, and race directing. He directs the Musselman Triathlon, the Fly by Night Duathlon, and the City of Portland Triathlon. To stay sane, he cares for Ophelia, Dixie, and Wyan, three charismatic yet remunerative backyard chickens..